It is another Verdian masterpiece that inaugurates the operatic season at the War Memorial Opera House. After Il trovatore in 2009, this year music director Nicola Luisotti opted for a monumental work from the repertoire: Aida. While there were both ups and downs in the performance, the overall spectacle was definitely a noteworthy one. The sense of suffocation and helplessness in relation to ethical, political, and personal values – family, homeland, love – was manifest in the claustrophobic multiplication of triangles on the set designed by Zandra Rhodes, in a co-production with the Houston Grand Opera and the English National Opera. Triangular patterns, close-ups (by means of massive panels), costumes, and many other geometric references created a perspectival space where everything foreshadowed the opera's ill-fated ending, in which, famously, the two protagonists are buried alive in the temple. One problem with the staging, for me, was its lack of subtlety, both in the painting patterns and in the architectonic elements: many visual details were endlessly multiplied – hieroglyphs, eyes of Horus – and dwarfed the drama on stage. These were useful insofar as they all evoked the intertwining between religion, politics and private spheres – so important for the economy of the opera. Yet, unfortunately, the space felt overcrowded by so many colorful, imposing references. Another problematic characteristic of this staging was the cartoon-like, careless quality of some of the props and painted patterns: these were were sometimes at odds with the intensity and gravity of the passions portrayed in the opera. On the other hand, if this worked against some of the most intimate numbers – such as Radames' outburst of love in "Celeste Aida" – it managed to create an effective setting for one of the most difficult scenes of the whole operatic repertoire, the Triumphal March. 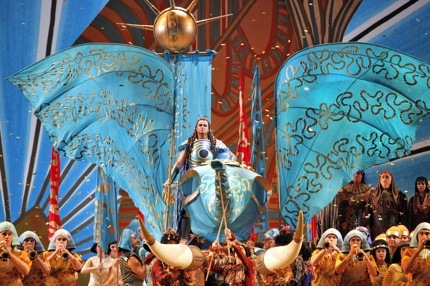 In this production, the animated atmosphere of the Egyptian victory was effectively portrayed on stage. The spectacle set up for the King of Egypt, including acrobatics, and mock-fights, and featuring dancing solos by Chiharu Shibata and Damon Mahoney, was memorable (despite the fact that, from our 21st-century post-colonial perspective, it is difficult not to reflect on the exoticized tones with which this opera, and this staging, are imbued). On the vocal side, Marcello Giordani gave his Radames a bright tone, and the puissance of his timbre was often overwhelming and suited to the impetuous Egyptian leader. If his acting was less effective than his singing, he did offer wonderful moments of intense drama, giving his best during the recitativi. 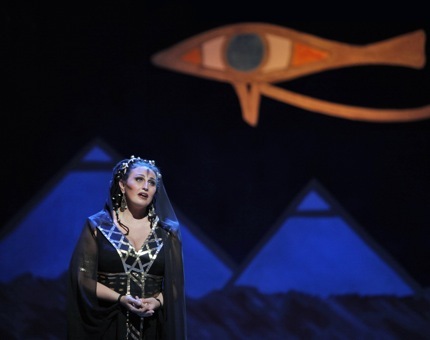 For me, the highlight of this production was Dolora Zajick's Amneris. Even when not helped by the overwhelming staging, the psychological drama that she carried by her lines was truly touching. In the first two acts, she came across as the ruthless and deceitful oppressor of the helpless Aida. Yet, as the plot went on, Zajick turned the princess' violence into a wide range of emotions: pity, fury and, finally, impotence against the priests' judgment on her beloved's treason. Zajick seems to be most comfortable in the lower tessitura, in which her unique timbre becomes dense and penetrating. But her whole interpretation was solid, and even at the top of her voice she demonstrated great control and fierceness. Sadly, the less convincing performance was the title role taken by Micaela Carosi. Her voice lies comfortably in the middle range of her part, and when she is at ease with her lines she can deliver a mellow colour. Yet, she was often perceptibly flat, and this feature marred many of her big numbers. Attention to detail is one of the virtues of the SFO performances. In this case, as well, comprimario roles were particularly well portrayed. Adler Fellows David Lomelì and Leah Crocetto were both excellent, interpreting a Messenger and the offstage Priestess respectively. Hao Jian Tian as Ramfis and Christian Van Horn as the King of Egypt, as well, were precise and effective in their renditions. Among the minor roles, once again Marco Vratogna offered one of the great performances that the San Francisco audience learned to appreciate after his company debut as Iago in the past season's Otello. Thanks to his strong characterization, his Amonasro was a catalyst for many feelings that are fundamental to this opera – such as the sense of belonging to a distant homeland, and familiar duties. 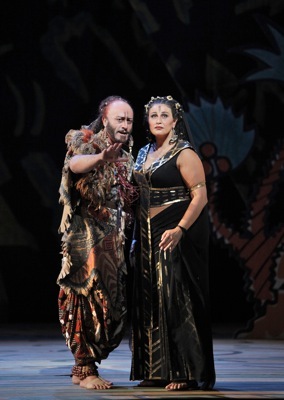 In particular, the menacing mention of Aida's mother was tremendously emphasized by Vratogna: with his ghastly timbre, he managed to bring to life one of Verdi's most elusive figures, the maternal image ("Una larva orribile fra l'ombre a noi s'affaccia…trema! Le scarne bravvia sul capo tuo levò...tua madre ell'è, ravvisala, ti maledice! "; "One among those phantoms dark, it stands before thee...Tremble! Now stretching over thee, its withered hand thy head doth mark! Thy mother's hands see there again, stretched out to curse thee!"). Vratogna's voice can come across as quite light, compared to others that have taken up this role; yet, his interpretive pathos certainly made up for some lack of resonance. The outstanding performance delivered by the Chorus was not a surprise: Ian Robertson's musicians have become a certainty on the SF Opera stage. Only in a couple of instances was there a lack of coordination between the chorus and the pit, but that did not manage to really mar the tremendous collaboration between the orchestra and the singers. It would be impossible not to acknowledge that Aida has become one of Luisotti's warhorses. After offering a memorable performance at Covent Garden a few months ago, he has shown once again his mastery of the Verdian repertoire. The expectations for his SFO Aida were high, and he lived up to them: he conducted with passion, shaping all of the score's nuances under his baton. The energy he transmitted from the podium materialized in the stunning crescendos of the most majestic parts, as well as in the suave pianissimos of the most intimate scenes. 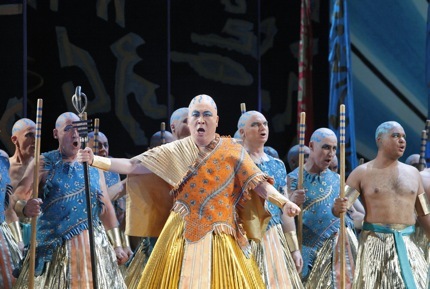 It was through the orchestral interpretation that, finally and most powerfully, the personal drama of each character, more than the monumental facets, came to life and made this Aida a spectacle worth attending.